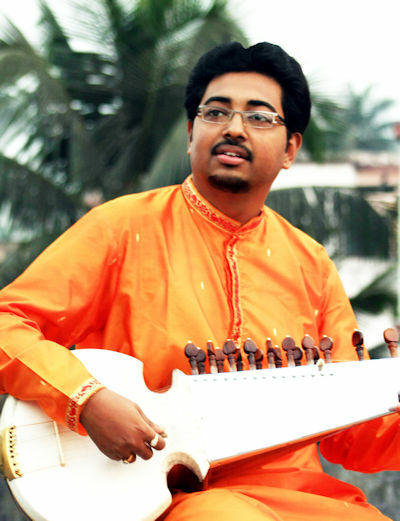 Abhisek Lahiri is a promising young sarod player. He is an artist of Indian national radio and television. He was trained by his father and Guru Pt. Alok Lahiri from a very early age. In his approach to Raga improvisation he blends the traditional norms with unanticipated notes and phrases. And, his approach to sarod playing incorporates the specialties of three major gharanas of Sarod, those of Shahajahanpur, Senia Maihar and Senia Bangash (Gwalior). Abhisek’s performances have won the hearts of thousands of audience across the globe. He started performing at the early age of 11 years. In 1997 he was invited by Pt. Hariprasad Chaurasia to play at Saath Saath Festival. In the same year he gave his debut of overseas performances in Holland at the World Kinder Festival. That was just the commencement of a prodigy's lifelong commitment towards music, later laid to concert tours in Europe, U.K., U.S.A., Canada, Sri Lanka, Japan, Bangladesh and India. He, along with his father Pt. Alok Lahiri, became the first Indians to perform at the European Parliament in France, at the Cannes World Music Festival and Canada Culture Days in Toronto. He has also performed at the RIMPA Festival organized by Ravi Shankar Institute in New Delhi, Dover Lane Music Conference in Kolkata, Harvallabh Sangeet Sammelan in Jalandhar, Saptak Music Festival in Nasik, Darbar Music Festival in London and many more. Abhisek has fused with the Japanese Guitarist Hideaki Tsuji and formed a group called Ionah. Abhisek's musical albums Sparkling Sarod got nomination at GIMA (Global Indian Music Awards) in 2010 and Mood Of Puriya Kalyan in 2014. He is the recipients of several awards and recognitions, such as the Anun Lund Rej Memorial Award from the Norwegian Consulate, Certificate of Appreciation from Rotary International Club & Lions Club, Toronto, The Telegraph School Award, National Scholarship from the Government of India, President’s Award by winning the first position in the All India Radio Music competition, Rashtriya Gaurav Award, Ustad Afzallur Rahman Memorial Award from Brahmanberia, Bangladesh, Jadubhatta Purashkar from Salt Lake Cultural Association and Sarbabharatiya Sangit o Sanskriti Parishad in Kolkata, India. Subrata Bhattacharya is an Indian tabla player. He is a senior disciple of late Pt. Shankara Ghosh. Subrata is known for his specialties in experimentations and reinterpretations the tradition of Indian music and culture. He comfortably trifles with a vast repertoire of musical genres, from classical, new-age, fusion and independent music. He was a visiting professor at the University of Urbana Champaign, IL. His music is strongly influenced by Indian Classical and Western Music. One of India's finest Tabla players, Subrata also holds the rare distinction of being one of the most well- known names in the world of Indo-fusion music. He has performed in India, USA, Europe and the Middle East with the renowned musicians like Dr. L. Subramaniam, Dr. N. Rajam, Pt. Viswamohan Bhatt, Pt. Budhaditya Mukherjee, Ud. Shahid Parvez, Pt. V. G. Jog, Pt. Samaresh Chaoudhury, Pt. Tejendra Narayan Mazumdar, Pt. Tarun Bhattacharya to name a few. Subrata has formed his band NTES (Naad-The Everlasting Sound), which made him one of the most popular musical stars of his generation. He has been a part of the Chicago-based Indo-fusion group Flat Earth Ensemble since its inception. Subrata recently formed an unique group EMME (East Meets Middle East) also based out of Chicago.